AncestryDNA has two things going on that genealogists need to know about this fine Sunday morning. And some changes in the privacy terms and conditions that users have to go along with if they want to test with AncestryDNA and/or continue using the AncestryDNA service. Let’s go with the easy one first. AncestryDNA has an Independence Day Sale going on right now, through 11:59 p.m. Eastern Daylight Time on Monday, July 6th. The price of an autosomal DNA test through AncestryDNA is down to $79, from the usual $99, for a 20% savings during the sale. The ad for the sale says the offer does not include shipping costs or applicable taxes. But folks have found that using the coupon code FREESHIPDNA sometimes works to reduce the shipping costs if multiple kits are ordered at the same time. So if you’ve been thinking about getting an AncestryDNA autosomal test done (an autosomal test, remember, is the cousin-finding test, the one that looks at the type of DNA we all inherit from both of our parents and that helps us find cousins to work with on our family histories1), now would be a good time to order. 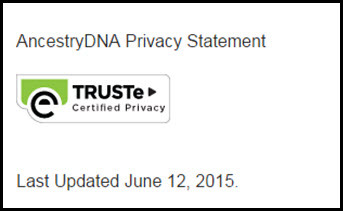 Privacy terms and conditions have been updated at AncestryDNA (and, by the way, at all of Ancestry’s other services, such as the main Ancestry.com site, Fold3.com and Newspapers.com). And the changes in those privacy terms are really very minor — but they incorporate a change from earlier this year that The Legal Genealogist (and everybody else) missed. And as human beings in a technological age we still generally just click through because, after all, what choice do we have? If we want to use AncestryDNA — and we do — we have to agree to the changes. So what are we agreeing to this time? Nothing that’s a whole lot different from what we’ve agreed to in the past — though — again — there was a change earlier this year that we all missed. So… since February 20th, we’ve all been bound by these new terms (and yes, you can delete your test and the results, but subject to the caveat that anything you’ve shared with others could have been copied and may be kept by those others). Now… is this a change worth getting up in arms over? To provide us with accurate analyses of our own DNA results, any DNA testing company should “internally analyze Users’ results to make discoveries in the study of genealogy, anthropology, evolution, languages, cultures, medicine, and other topics.” The more internal analysis of user data that’s undertaken, the better the matching algorithms, ethnicity estimates and the like may be. As long as the use of data outside of a testing company is controlled by “the Research Project Informed Consent … in accordance with the Informed Consent,” there’s absolutely nothing wrong with a testing company using its customer data to produce a better result for its customers. • The terms now clarify that any comments you post on the website are part of the information that may be read, collected, and used by others. And that’s really pretty much all that’s changed in this latest round of changes at AncestryDNA. We’ll go over the overall changes at Ancestry.com and other non-DNA websites run by Ancestry tomorrow… and those current changes are minor, too. I’m also concerned with the changes they are making to their subscription service. They are not being very forthcoming with information about that and other bloggers are saying the changes are substantial. Can you elaborate? Thanks, Judy! I looked over the new T&C and couldn’t figure out what was new. Now I know why.